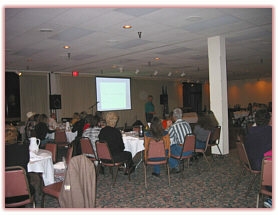 We have been doing Teaching Clinics for a number of years now. Our primary motive is to educate horse owners about something that very few of us knew about not that long ago. We have always felt that, the more horse owners knew about their horse's needs, the better they would know to take care of them and the horse would come out the winner. Even the most well-meaning among us, are neglectful if we don't know any different. 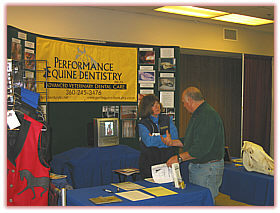 dentistry and how it relates to the whole horse's health and longevity. saving decayed teeth from painful fractures and abscesses with "fillings"
saving teeth and getting rid of infection that makes a horse systemically sick and can deplete energy. A discussion from the "horse's mouth". Correct occlusal equilibration or "floating" teeth so that they are balanced correctly, doesn't everyone do it? Any group of approximately 12 or more who want to learn. (With children's groups, we ask that there is still a minimum of 12 parents who can come). We also speak to many organized horse groups or even a group of friends. Clinics are very informative. It's very interesting to actually see (and sometimes feel) the condition inside our horse's mouths. It's often amazing what we find in there and to realize just how little our horses complain! If you're interested in hosting a clinic, go to Contact Us for more information.